The officially recommended daily allowance of vitamin C (90 mg per day) is an artificial figure. Most scientifically-determined optimal daily allowances range from 300 milligrams to 1.2 grams each day. 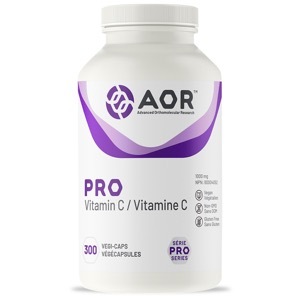 AOR's Pro Vitamin C contains 1000 mg per capsule of vitamin C.
Vitamin C was first recognized for its role in the formation of collagen, which is the connective tissue of skin, bones, cartilage, teeth, muscles, and blood vessel walls. Vitamin C is also useful as a treatment for colds, likely due to its effects on the immune system. AOR's Vitamin C formula is a high dose, pure ascorbic acid and can benefit everyone. Adult Dosage: Take 1 capsule daily with/without food.